Core drill sampling: What happened and what DID NOT happen… Last week, OSFR, residents and Christopher Byrd (IREPHA lawyer) stopped Sabal Trails from drilling for core samples for the purpose of building a drilling platform on both sides of the Santa Fe River. OSFR began receiving phone calls and emails last week about this drilling procedure. We were absolutely certain that this was a “cart before the horse” problem. There have been no completed Environmental Impacts Studies/Surveys (EIS). FERC told us they could take up to 2 years to complete (technically they began at the end of 2013). As for the SFR, 33rd Road on the Suwannee County side and NW 130th Street on the Gilchrist County side are the immediate neighborhoods most in peril. Sabal spoke to residents by phone about sending survey people out to these areas to begin staking and taking core drilling samples to find out the nature of the ground material for the intention of building a drilling platform that is designed to put a horizontal directional bore drilled hole to snake a “36” inch gas pipeline under the Santa Fe River. How far under the bottom of the River? 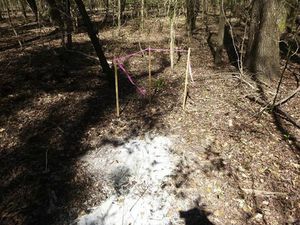 Sabal representatives have said they try to find at least 20′ below the bottom of the river bed and then the platform is to be constructed out of the wetland delineation (at the Gilchrist meeting they told the audience that they find the center of the waterway and measure 1000′ on each side, roughly 2000′ feet and dig an underground channel that connects to both sides of the waterway). This pat answer leaves me wondering, how are they to do that with flood stages as they are today (March 20, 2014)? OSFR and most of us in this region, know and understand our karstic terrain and the Aquifer water that runs underground in natural conduits and channels. The very idea about this type of drilling makes many of us question if this company is experienced with Florida geology? A bigger question mark is directed toward how this company expects to dig through our Florida Springs Heartland with similar conditions from Georgia to Orlando. This pipeline is crossing countless Rivers and waterways, and known precarious sinkhole terrain. I will do my best to compile a list of waterways in another posting; since Sabal has been tweaking the projected path since last year it may be difficult to get all of them listed, but certainly the major ones will be noted to you. So as for the core drill sampling, we stopped them proceeding with this invasive exploration with no permits or approval from the FERC, or any local/state authorities. There is still a long list of State and Federal agencies that must review Sabal’s proposed route, again, I reiterate, the proposed route has NOT been decided. Sabal has at least 5 routes in our own area of the Santa Fe River that are in review. OSFR will have more on this in another posting… There is no need to be core drill sampling for drilling platforms at any of the potential routes! This photo was taken on the Suwannee County side in the community property holdings of TREPO (off of 33rd Road). It is a deep hand augured core drill sample. Not allowed!!! Sabal did this prior to us raising questions. If any of you see or have contact with the gas pipeline company and you have questions private or public message us here.